The kung fu film genre arose in Hong Kong as a reaction to the then dominating wuxia martial arts films. Within the wuxia genre, the events typically take place in a very distant past, in a period known as shenguai wuxia, and various supernatural elements are important for the plot. 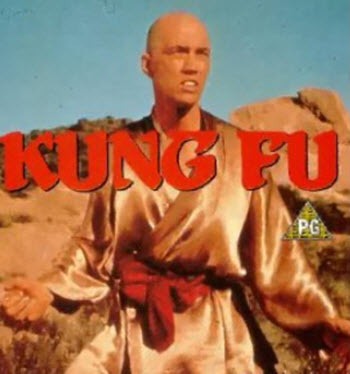 The kung fu movies rebelled against this by having contemporary stories or stories set in fairly recent history, and usually without any supernatural forces. Also, the martial art scenes in early kung fu films tended to be more realistic than in wuxia and less dependent on special effects. They were also much less likely to involve swords. Unarmed combat was a distinct feature of early kung fu movies. Another notable difference is that wuxia movies tend to take place in ancient China, while the emerging kung fu genre was less fixated on that and could involve other East Asian countries. These two movies, released in 1938-1939, are generally acknowledged as the first films in the kung fu genre. Regrettably, no copies of them have survived. The movies are based on the legendary Fong Sai-yuk, a folk hero and martial arts expert associated with the Five Elders of the Southern Shaolin Monastery. Released in 1949, the first two films in the Wong series, directed by Wu Pang and starring Kwan-Tak Hing, are notable for their focus on realistic fighting (zhen gongfu). This set them strongly apart form the highly unrealistic fighting offered by the wuxia films. The Wong series was a series of films that dramatized the life of the Cantonese martial arts expert, physician and folk hero Wong Fei-hung (9 July 1847 – 17 April 1925), also known as Tat-wun. In the early 1970s, the kung fu genre went through a major resurgence in Hong Kong, with the film The Chinese Boxer (1969) generally seen as the starting point for this new wave of Hong Kong kung fu movies. Hong Kong went through an economic boom in the early 1970s and a lot of people had money to spend on entertainment, such as going to the movies. In Hong Kong, the rivalry between the film studio giants Golden Harvest, Seasonal Films and The Shaw Brothers helped spur innovation and make the kung fu genre grow and develop. The seventies became a golden age for kung fu movies in Hong Kong, and this was also the decade when movie goers outside the Far East really began to discover what this exotic genre had to offer. The kung fu movies released outside the Far East in the 1970s were usually dubbed, with varying results. The kung fu movies of the 1970s often had anti-imperialist and anti-discrimination themes, and featured underdogs successfully fighting the big and powerful, which struck a cord with marginalized audiences, especially in recently de-colonized countries around the world. Hong kong kung fu movies also proved to be a big hit among African-Americans and several other minority groups in the United States. One example of a movie that helped spur an interest for Hong Kong kung fu outside the Far East is The Big Boss, starring Bruce Lee as an young Chinese man who fight a big drug smuggling ring in Thailand. Released in Hong Kong in 1971, it eventually reached movie goers in places such as the United States and the United Kingdom – after much censorship of the extraordinary violent and gorey fighting scenes. The success with The Big Boss, as well as several other films starring Bruce Lee, started a trend of casting actual martial arts practitioners (such as Bruce Lee) in kung fu movies. In 1973, a stock market crash brought on an economic recession in Hong Kong, which promoted movie goers to seek out comedies and satiric films. To adjust to the changing climate, studios began making comedic kung fu, merging martial arts with slapstick and Cantonese satire. A major milestone in the history of comedic kung fu is the 1978 movie Drunken Master, which turned its leading actor Jackie Chan into a major movie star and helped the genre kung fu comedy take root around the world, including markets such as Europe and North America. Along with Sammo Hung, Jackie Chan integrated techniques from Peking Opera into the kung fu genre. Both Hung and Chan were trained in Peking Opera (Jīngjù), a form of Chinese opera that combines music and song with acrobatics, dancing and miming. Hung and Chan are largely responsible for the fluidity and acrobatic elegance featured in the comedic kung fu movies, and which eventually spread to non-comedic kung fu films as well. Kung fu movies have inspired a large number of casino slot games. Most of these games are losely based on different movies and many of them have pun names. Examples of slot machines that have been inspired by Kung fu movies includes pows of fury, inspired by the 1971 movie Fist of fury (The big boss). It is alos obvious that this slot also found inspiration in the movie Kung fu panda. The main Caratcter is a panda. Another slot machine that have been inspired by Kung Fu panda is Panda Pow. One of the most popular kung fu inspired slot machine is Kung fu rooster (there is also a Kung fo monkey slot). Other kung fu casino slots include Kung fu furry and kung fu cash. You can play these and other slot machines in different online casino. Most of these games are from different developers so it can be hard to find all of them in the same online casino. You might have to register in several casinos to try them all. This is unfortunate but a benefit of registering in several casinos is that you get several casino bonuses. If you want to try to play Kung fu inspired slot machines then i recommend you try Slotocash casino (Review) or LeoVegas Casino. They offer a very large selection of slot machines.